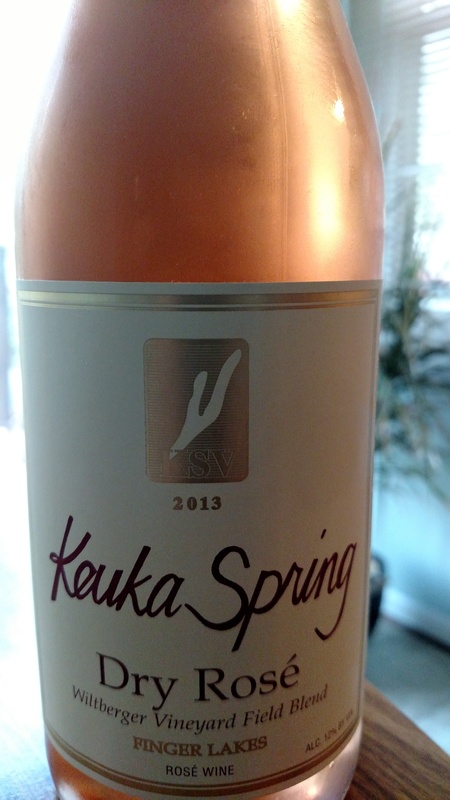 Keuka Springs Rosé – Wiltberger Vineyard Field Blend | Wine Splash! I just Love Summer with all its sounds, smells, and flavors! The feeling of sand between your toes, the smell of BBQ in the air, and the taste of a vibrant, chilled wine. Speaking of chilled wine, here is an amazing Rosé that is sure to beat the sultry, Summer heat! From Keuka Springs Winery in the Finger Lakes, NY, this Rosé has won many awards and medals from New York to San Francisco! A “Field Blend” of Lemberger, Cabernet Franc, and Merlot makes it a nicely balanced wine. Salmon pink in color with aromas of fresh strawberries, watermelon, and spice. Medium mouth-feel that is lush but with a citrusy tang. Flavors of ripe red cherry, zesty raspberry, and lime across the palate. On the second sip, more citrus flavors came out along with vibrant white peach, watermelon, and a hint of minerality on the long finish. Perfect pairing with your favorite pizza, hors d’oeuvres, grilled salmon, baked ham, summer salads, and medium cheeses. Let your imagination run wild because this Rosé is very versatile! A fruit forward, dry Rosé that even the sweet tooth in your family will enjoy. 89 Points! WineSplashing! !